What a way to start off our spring wedding season! Yesterday, we drove up to Baltimore to the ever famous Belvedere wedding Hotel in Baltimore to photograph Korey and Chad’s big day! 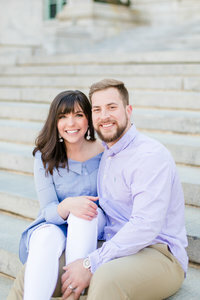 Korey is the marketing and advertising coordinator at the Belvedere, so we were beyond honored and amazed when she told us that she had to have US be her photographers given how many photographers work she has seen! One thing that we love about Korey and Chad is that they have been through a lot and when everything goes bad, they still find ways to laugh through their situation, no matter what it may be. They truly communicate throughout everything and are always on the same page in the end (especially if they weren’t in the beginning). One word that describes them as a couple? Easy. It’s easy to be best friends. It’s easy to find things to talk about and find things in common. Its just easy to be all the things you need to be in a relationship. Where she lacks, he picks up. Where he lacks, she’s got it. It’s just so easy to be understanding, patient and to be in love with each other! Enjoy the rest of our favorites from yesterday at The Belvedere & Co.! How stunning is this reception?! To say it was a great night would be a huge understatement. Congratulations Korey and Chad! Thank you for letting us in on such a magical night! To view more weddings, browse the links below!